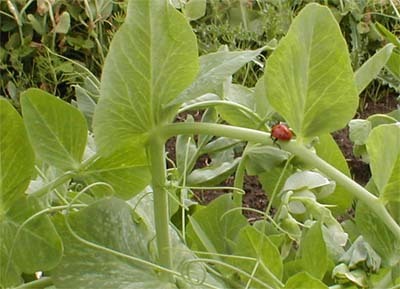 This ladybug is on pea shoot patrol. Do you see any aphids? The conventional view of farming treats the soil as a substrate—a two-dimensional canvas on which to grow crops. You plant the seeds, feed and water the plants, and harvest the crops when they’re ready. 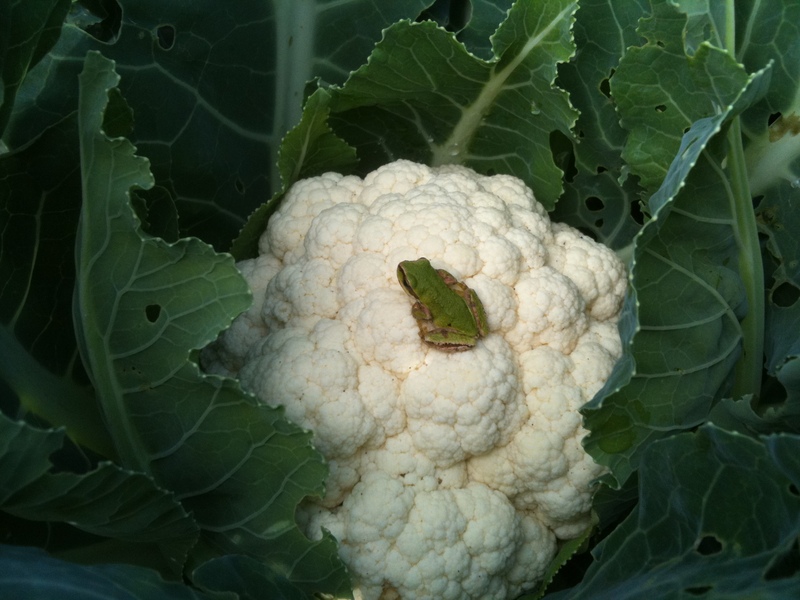 We have an abundance of tree frogs on our farm. We find them everywhere. We see things a little differently. Our view of the farm is a three-dimensional microcosm that reaches high up into the atmosphere and far down below our water table. Our fences mark the edges of the property, but we feel that our influence reaches far beyond those physical boundaries. Within the ambiguous reaches of our farm live billions of microscopic creatures: plants, animals, bacteria, fungi,and more. Some we can see, and the rest are far too tiny to be seen without a microscope. Some we think we understand, and many more we don’t even know about. 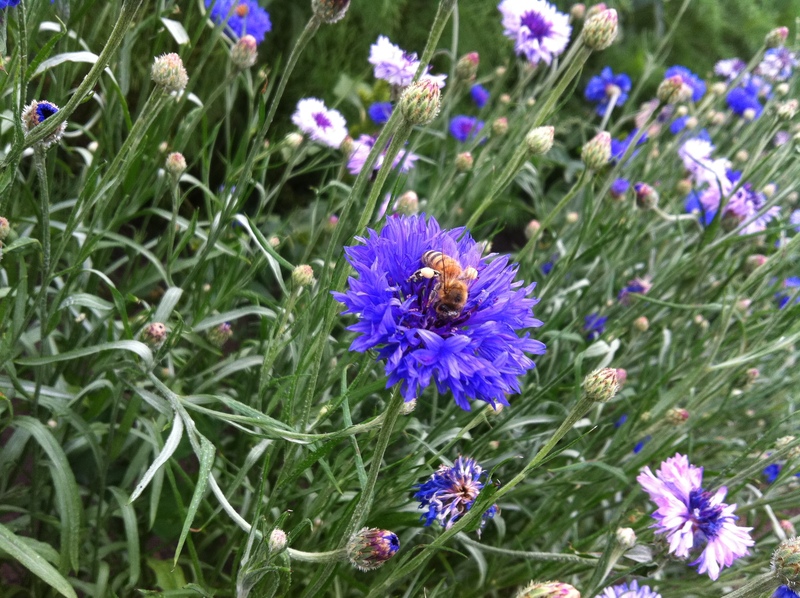 Honeybees love the cut-flower garden. There are many millions of microorganisms in a single teaspoon of healthy soil, including bacteria, fungi, nematodes, and protozoa. Isn’t that astounding? The great majority of them are beneficial, feeding on decomposing organic matter and gobbling up pathogens. In this process, they make nutrients available to our plants. So really, when we are applying a natural fertilizer, we are feeding these little workhorses that we can’t even see—and they are taking care of our plants. 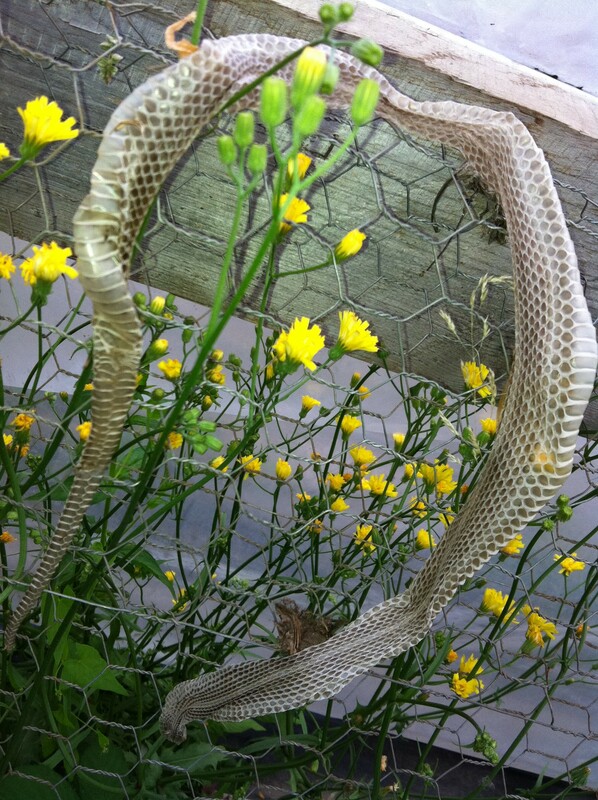 Snakes love heat, and they are pretty easy to find on the black plastic mulch in the field, as well as in the greenhouse. The worms in the soil act as tiny rototillers, aerating the soil and lumping the particles together into bigger pieces so that roots can easily extend into the empty spaces. Above the ground, beneficial insects, frogs, and songbirds feed on insect pests so that we rarely have a pest problem. Pollinators, including many species of bees, are vital—we wouldn’t have squashes, berries, cucumbers, or peppers without them. In short, we have to look at the big picture when we talk about our farm. We feel responsible for all the birds, frogs, snakes, skunks, insects, etc. that live here. They are our livestock too. 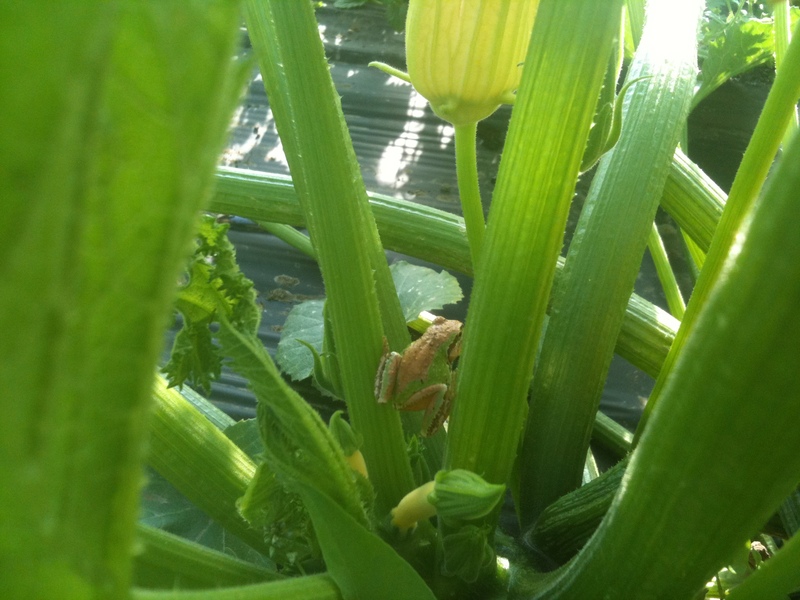 Little frogs keep the bugs away from infant squashes.